The service of Vespers belongs to the most ancient layer of Christian liturgical services, because originally, early Christians gathered for common prayer in the morning and in the evening. And it was only throughout the 4th century, with the rise of organized monasticism, that the additional services of the Hours began to be developed. Hello! I’m Sr. Vassa, and once again, I’m having my coffee here in Vienna, in Austria. Today I’m having coffee from Guatemala. This coffee was given to me, very kindly, by Mother Yvonne from a convent in Guatemala, that also has an orphanage – and they do amazing work. So, I thank Mother Yvonne for giving me this coffee. Now, I have some other good news for you, and I’ll just say it quickly, – that one of our zillions of viewers, named Joe dos Santos, has, as a surprise, created a beautiful website for our show. It’s called: www.srvassa.com. I know, it’s a coincidence, that’s also my name, and you can get one of our all-new, very popular mugs there, finally, online. See, they make very nice Christmas gifts, and they also help support us in our efforts to make DVDs for you. We want to make DVDs of the whole year, you know, from our YouTube video. Anyway, take a look: This makes a nice Christmas gift. It’s a red Christmas mug, and it says “It always feels like Christmas” and “Watching Coffee with Sr. Vassa”. It’s nice and big. And there is a black mug that says “I’m one of the zillions,” and “I watch Coffee with Sr. Vassa” on the other side. Note that it’s appropriate for tea-drinkers. Anyway, I am going to stop hassling you about these matters, and get on with our show – which is a little bit different today. Today we will be reflecting on one of the church services of the Byzantine tradition, the evening service called “Vespers”! I know, I know, – please hold your applause. I get excited just mentioning Vespers… The word “Vespers” comes from the Greek word “espera”, which means “evening.” Now, some of you might not ever go to church for this evening service; some of you might not go to any Byzantine-rite evening service, while yet others of you might not go to church, period. Nonetheless, I think you will find this topic interesting, even perhaps helpful, and I’ll tell you why. Because, you see, zillions, a service like this, which is dedicated to a certain time of day – the evening – offers us topics for reflection in the evening – appropriate to any evening, if we are interested in thinking inspiring and faith-filled thoughts at the end of our day. 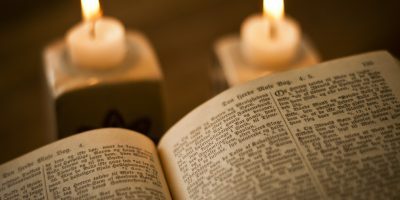 Because in the evening, as we all know, we are often tired and perhaps burdened by anything that went on during our day, and we might find ourselves very far from any thought of God or our faith – even if we started our morning many hours ago with prayer and a little bit of reading of Scripture. Now, in the evening, we might just want a drink, and to relax in front of the television or in front of our computers. I am aware of the fact that, regardless of what I tell you about Vespers today, – that is precisely what many of us will continue to do in the evening. 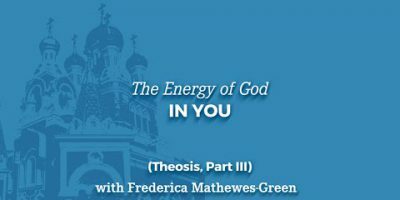 However, it is realistic for us to remind ourselves of the topics offered to us by Vespers, perhaps while we’re driving home from work, or a few minutes before going to bed, or while walking home from school. We could think about certain topics that Vespers call to mind. Now, today we will just take a look at the main components of Byzantine Vespers, and its main themes. And, in future episodes, we will reflect more deeply on separate parts of Vespers. 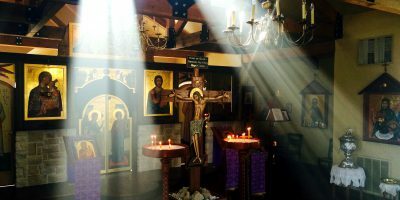 (St. Cyprian and Justina Monastery choir sings: Lord, I have cried…) The service of Vespers belongs to the most ancient layer of Christian liturgical services, because originally, early Christians gathered for common prayer in the morning and in the evening. And it was only throughout the 4th century, with the rise of organized monasticism, that the additional services of the Hours began to be developed. But let’s move on to the next component of Vespers, which is a set of psalms, beginning with Psalm 140, “O Lord, I have cried to You, hear me, O Lord…” (the “Kyrie ekekraksa”). These Psalms bring us to the repentant theme of Vespers, for anything we did wrong during the day, and help us refocus and reaffirm our desire to do better in everyday challenges, like watching our mouth: “Set a guard, O Lord, over my mouth; it says in this Psalm; Keep watch over the door of my lips…” (Ps 140/141: 3-4). At this point during Vespers we also hear special hymns to the saint or feast of tomorrow, because Vespers begins the liturgical day that is tomorrow, – but it begins this evening. But this part of Vespers changes from day to day, and we will be focusing on the unchangeable parts, which comprise Vespers of any day. And the next unchangeable part is the ancient Hymn “O Gladsome Light,” (the “Fos ilaron”), which is a poetic composition, like a love song to Jesus Christ. It probably dates from the 2nd century, and compares Christ to the soft, evening light of the setting sun. Have you ever thought of Christ while observing a beautiful sunset? Well, Christians have, for many centuries! Now, note that the topic of light, in general, is also an important theme for Vespers, because in antiquity, the evening was the time when people lit their lamps, and ancient Christians thanked God for the gift of fire, – that basic necessity that provided light and warmth after the setting of the sun. Moving on, the next thing we hear at Vespers is a short verse called the “Prokeimenon,” and we have a different one for each day of the week. Next, there is the prayer, “Vouchsafe, o Lord” (Kataxioson, Kyrie), and this asks God to preserve us without sin this evening. – Good luck with that, if you’re going to spend it online! But I have to cut this short now. Next week I will discuss the final part of Vespers, and concentrate on one of the hymns we already discussed. Because I just don’t want to go overtime today. OK? So – tune in next week, and we will continue our discussion of Vespers. Please, focus your thoughts this evening! Think good thoughts, think faith-inspired thoughts! And I will see you next week. Thank you!